Today, the students in my Humanitarian Logistics and Healthcare class and I had the true honor and pleasure of hearing Mr. Brian Rust, who is the Manager of Security and Emergency Preparedness at Cooley Dickinson Hospital in Massachusetts, deliver a guest lecture on Hospital Emergency Preparedness at the Isenberg School of Management. Cooley Dickinson Hospital is a 140 bed acute care community hospital, providing primary care 24/7 for Hampshire County residents and neighboring communities. It is part of the Partners Healthcare Network and is now owned by Mass General Hospital in Boston, one of the world's leading hospitals. Cooley Dickinson aims to provide the best healthcare in the most appropriate setting. Mr. Rust has 11 years of experience at Cooley Dickinson Hospital and previously also worked in the police department and at Smith College. Mr. Rust's guest lecture was fascinating and provided us with a wealth of information on emergency preparedness in the very important hospital healthcare setting. At the beginning of his lecture, Mr. Rust told us that hospital emergency preparedness lies somewhere between preparing for emergencies and preparing for disasters since every day a hospital is involved in life or death decisions. He noted that it is important to identify: What are we preparing for? since preparing for anything, anytime, is much too general. He noted that the hospital prepares for "any incident that has the potential to have a negative effect on normal operations of the hospital." The Joint Commission is the regulatory body that also accredits hospitals and it emphasizes communications, resource and asset management, the importance of the functioning of utilities (he mentioned the huge impact that a water main break would have on hospital operations, for example), as well as patient clinical support. Events, originating with 9/11, and including natural disasters such as Hurricane Katrina, have stimulated the growth in and emphasis of hospital/healthcare emergency preparedness. 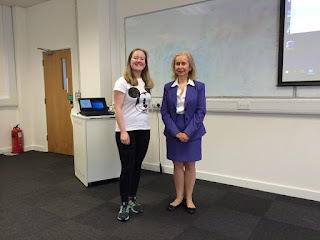 I was delighted that he mentioned so many issues and events that we had been talking about in the course so far (and even had other guest speakers on) from the Ebola outbreak in western Africa (that Cooley Dickinson even prepared for and learned lessons from) to the Boston Marathon bombing. He also spoke about the ASPR (Assistant Secretary for Preparedness and Response) and that hospitals have realized that one needs a system-wide perspective, even if hospitals, which are non-profits, compete with one another for patients, since although they are non-profits, they are still businesses. Means of cooperation include: fatality management, information sharing, dealing with medical surges, and even volunteer management, along with emergency operations coordination. Cooley Dickinson Hospital is part of a health and medical coordinating coalition. Members include hospitals, public health facilities, long-term care facilities, community health centers, and EMSs. 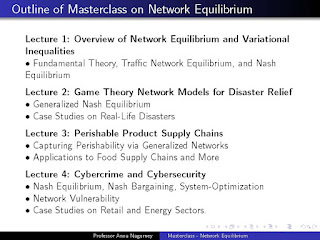 He also emphasized - as several of the guest lecturers this semester have - that relationships between these various entities have to be built before emergencies and disasters occur. Despite numerous documents and plans, when an emergency happens, the training and experience kick in, and no time should be wasted in response. Mr. Rust also reinforced the importance of practice drills and mentioned a recent exercise that his hospital was involved in which simulated a norovirus outbreak post a wedding with twenty patents arriving in the emergency room in twenty minutes. He also spoke on the scheduling of hospital staff, and the replenishment of supplies and medicines, and the fact that older hospitals do not have much (if any) space for warehousing. He talked about the maximization of existing resources (great reference to operations research) and the strengthening of community health resources and emphasized that it is humans that play the most important roles. In speaking about the different regulations (and associated organizations) he mentioned CMS (Center for Medical Services) and how it identified such key essentials in hospital emergency preparedness as: safeguarding human resources, maintaining business continuity, and protecting physical resources. A hospital is supposed to be operational and self-sufficient for 72 hours following a disaster. Towards that end, he noted how Cooley Dickinson has alternative fuel sources and also mentioned how generators on low levels of healthcare institutions flooded both during Hurricane Katrina as well as Superstorm Sandy (something I had also mentioned to the class). One of my favorite takeaways and quotes from today's fabulous lecture, during which I took copious notes, was that "hospitals are a team sport." He spoke about the hospital incident command center and how incident command centers evolved from battling fires (I had shown the students a video of the response to San Diego's fires of a while ago which illustrated precisely such an incident response system, so the analogy, although not perfect, was great for the students to hear). "storm of century" media hype. And what have hospitals learned from the various events and experiences? They now have procedures and policies and understand the value of working in concert plus "in a disaster, we all have to be together as one." After the class and so many very interesting questions from the students, we took the group photo below. We are truly grateful to Mr. Brian Rust for taking the time out of his very busy professional schedule to share his very valuable insights and expertise on hospital emergency preparedness with us. This is a guest lecture that we will never forget. He was an amazing Professor for a Day at the Isenberg School! 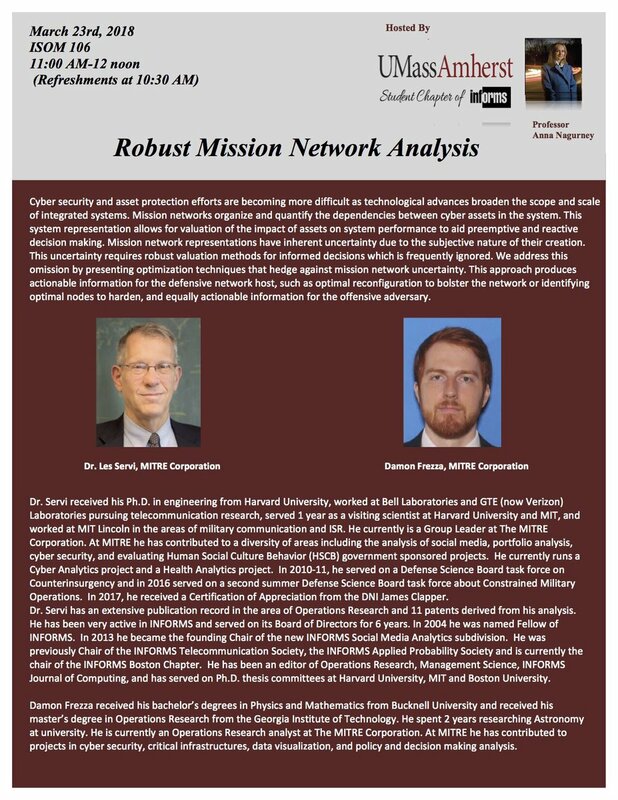 After my return from almost 2 weeks in Europe, in addition to seeing my students, I was very much looking forward to the talk by Dr. Les Servi, which took place today in our UMass Amherst INFORMS Speaker Series. Dr. Servi is a Group Leader at MITRE Corporation in Bedford, Massachusetts and is an INFORMS Fellow. I have known Les since our Brown University days in Applied Mathematics. He went on to get a PhD at Harvard and has had an illustrious career in industry. I stayed and received my PhD at Brown and became an academic. 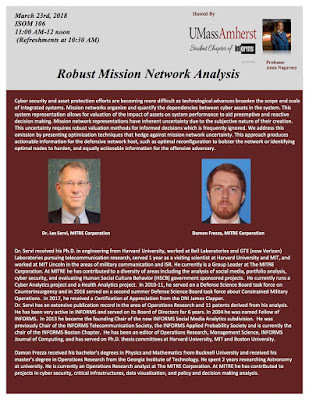 The title of Les' talk today was: Robust Mission Network Analysis. Deniz Besik, the President of the UMass Amhers INFORMS Student Chapter, and I had the pleasure of introducing our terrific speaker today. In his talk, Dr. Servi emphasized the importance of finding useful patterns, and displayed a Dilbert cartoon, which noted that The Math should fix the guessing. His tweet on that cartoon he told us generated over 17,000 views. 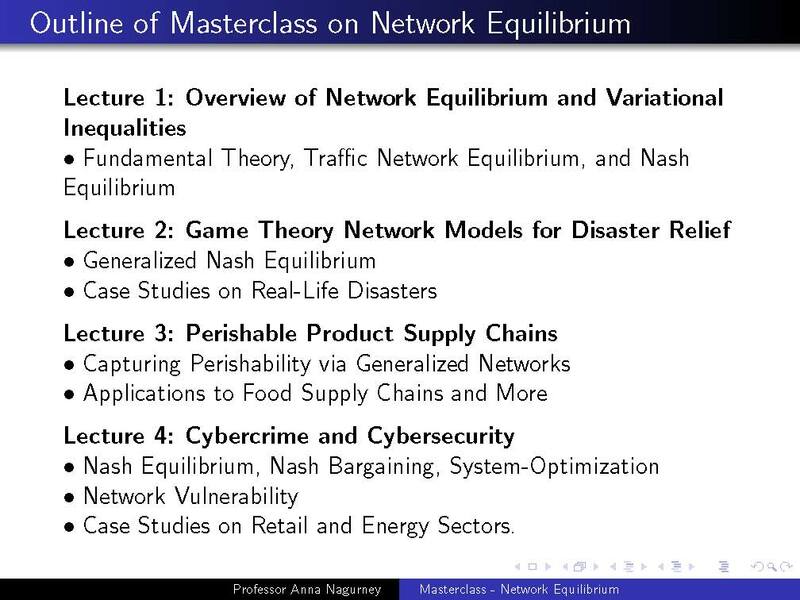 In his talk, he described an extension of robust optimization in the context of functional dependency network analysis (FDNA), followed by analysis without hedging and then analysis with hedging. His presentation was based, in part, on two papers of his, and also more recent work, with the papers being: "Deriving Global Criticality Conditions from Local Dependencies Using Functional Dependency Network Analysis (FDNA)", which he co-authored with P.R. Garvey, and which was published in the journal Systems Engineering in 2017 and the paper: "The Last Word: A Modeling Model," which was published in the Phalanx in 2017. He kindly shared these two papers with me and the figure below is from the latter and it is a variant of the figure, featured above, which was emphasized throughout his lecture today. Simplicity, when effective and appropriate, is the highest form of modeling. Hope is a bad strategy for dealing with what is unknown. A model may have needless complexity, with a complex model's fragility producing unanticipated interactions among variables leading to spurious decisions. One should practice cautious hedging. I very much enjoyed hearing about FDNA in order to capture graphically, via a network, the goal of a mission and the various mission tasks (children). He spoke about each link of the network being characterized by two parameters, which can involve a lot of interviewing of experts to determine appropriate values (and ranges) of. The network topology captures the dependencies among mission tasks. He described how the use of the chain rule can help in determining the derivative of the top node (the mission goal) with respect to other nodes, but then also mentioned that sometimes the derivative may not exist. 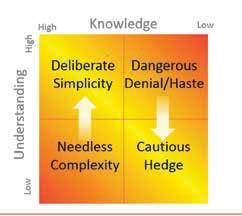 The cautious hedge involves solving a robust mission problem. Of particular note, was identifying critical nodes in the network. 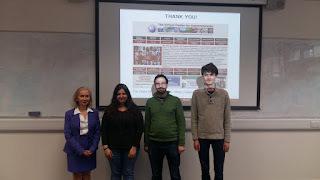 We took a group photo after the presentation. 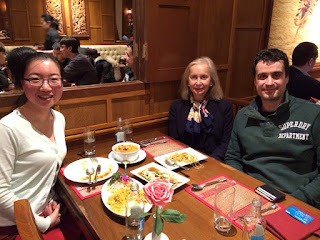 A special surprise was to have Karen Li, an Isenberg School of Management alumna, class of 2017, who was also a Commonwealth Honors College graduate, and winner of the UMass Amherst Leaders for the 21st Century Award at graduation last May, travel from Boston to come to the talk. Karen was featured in an article when we published a paper based on her honors thesis. Lunch at the University Club that followed was a special treat with even INFORMS Fellow Dr. Peter Haas (formerly of IBM and now of the College of Information and Computer Sciences at UMass) joining us. We thank Dr. Servi for sharing with us his latest, fascinating and extremely applicable research! 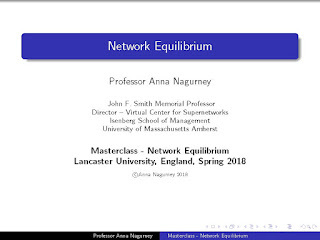 I am back in Amherst, Massachusetts, after being in Europe for 10 days, traveling first to southern Italy where I gave a keynote talk at a conference in a castle and also blogged about it, followed by a fabulous day in London, and then several days in Lancaster, where I taught a Masterclass on Network Equilibrium at Lancaster University. There I was hosted by STOR-i, which is a Center devoted to doctoral training in statistics and operational research (or, as we say in the US, operations research). 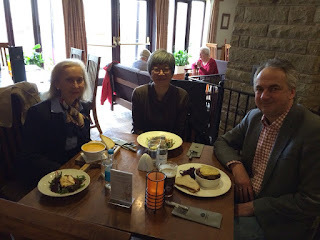 I had been invited to teach the Masterclass last summer, and, since I had given a talk at Lancaster, when I was a Visiting Fellow at All Souls College at Oxford University in the spring/summer of 2016, and enjoyed the experience very much, I accepted the invitation. 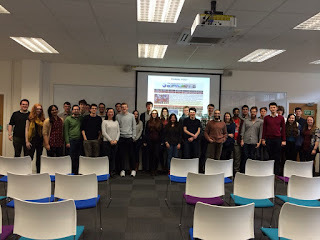 The colleagues in operations research/management science at Lancaster are extraordinary so I was looking forward to seeing them again and also to meeting students that would be taking my Masterclass. 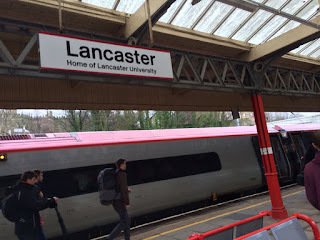 This past week was spring break at the University of Massachusetts Amherst so instead of teaching at the Isenberg School of Management I would be teaching at Lancaster University. 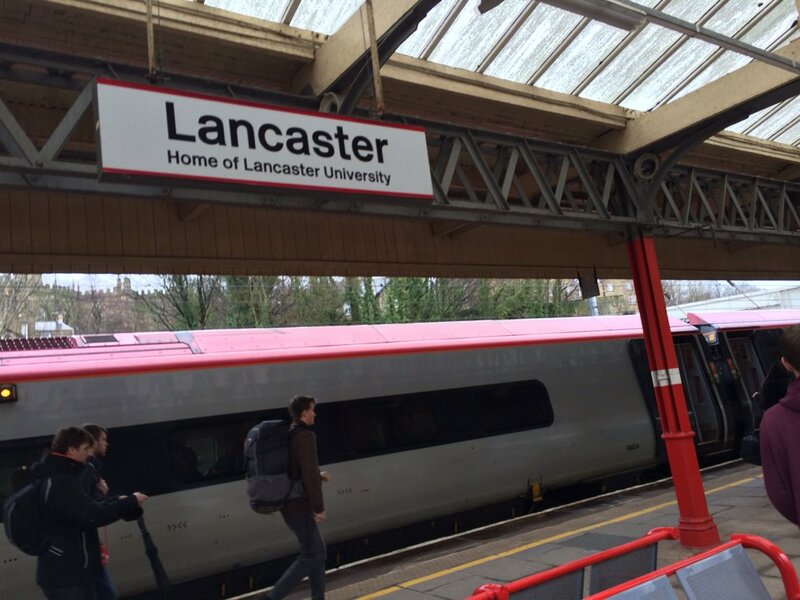 On March 11, 2018, I took the Virgin train from Euston Station in London to Lancaster and was delighted to see that the station was promoting the University. A short taxi ride brought me to the Lancaster House Hotel, which was my domicile for the duration of my stay and the view from my hotel was perfect with seagulls often chirping. 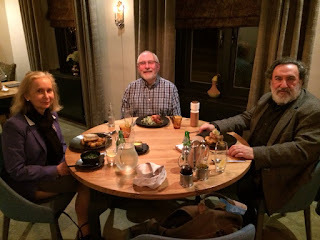 My first evening in Lancaster, I had the great pleasure of having dinner with Professor Graham Rand, who is an extraordinary ambassador for both INFORMS and IFORS, and I have lost track as to the number of conferences I have enjoyed seeing Professor Rand at. Meeting the students was a delight and I very much appreciated their insightful comments and questions. Special thanks to Lucy and Luke, two STOR-i doctoral students, who accompanied me to one of the lunches. 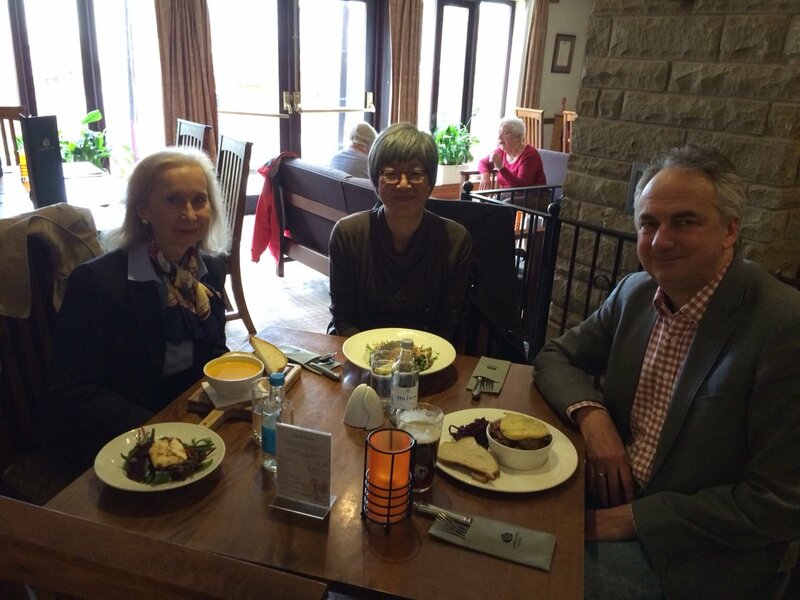 It was also wonderful to be able to see Professor Matthias Ehrgott and Professor Judith Wang of Leeds University, for a lunch. 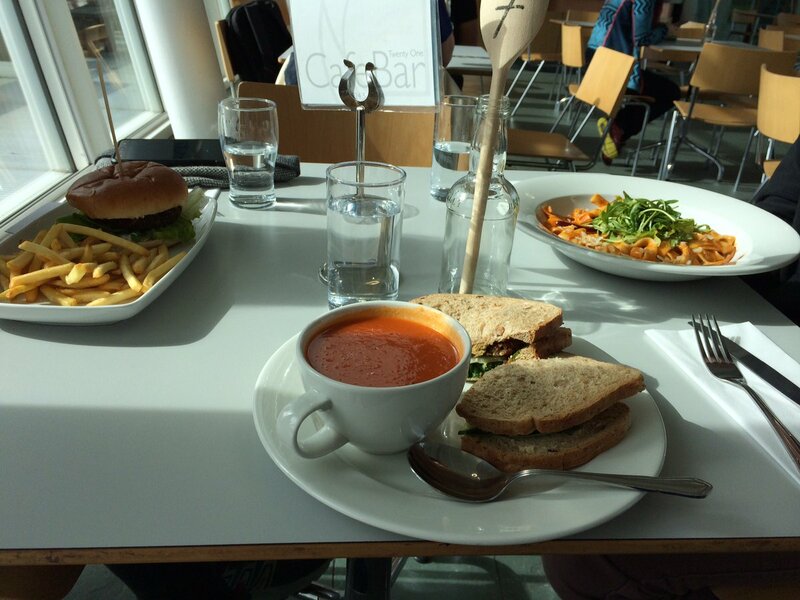 I have dined with them even in Auckland, New Zealand, where they were faculty before coming to the UK. Professor Ehrgott has served as the Chair of the Management Science Department at Lancaster, the largest department of its kind in England! A special thank you to Ms. Rosemary Hindley, who made the arrangements for me and the hospitality extended was exceptional and which I so much appreciated! Other highlights (yes, I did a lot of lecturing (8 hours worth) but also a lot of eating, which kept my energy level high) included dinner at a Thai restaurant with Professor Pavlidis and his doctoral student, and dinner with two Distinguished University Professors: INFORMS Fellow Professor Kevin Glazebrook, the Director of STOR-i, and Professor Konstantinos Zografos, whom I have known for many years (and he received his PhD at the University of Connecticut and has been recognized with, among his awards, an engineering alumnus award). 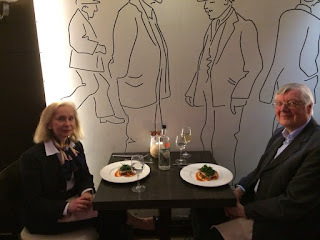 Professor Glazebrook drove us to the restaurant through the countryside, The Lunesdale Arms in Tunstall, where I had one of the most delicious meals in my life! 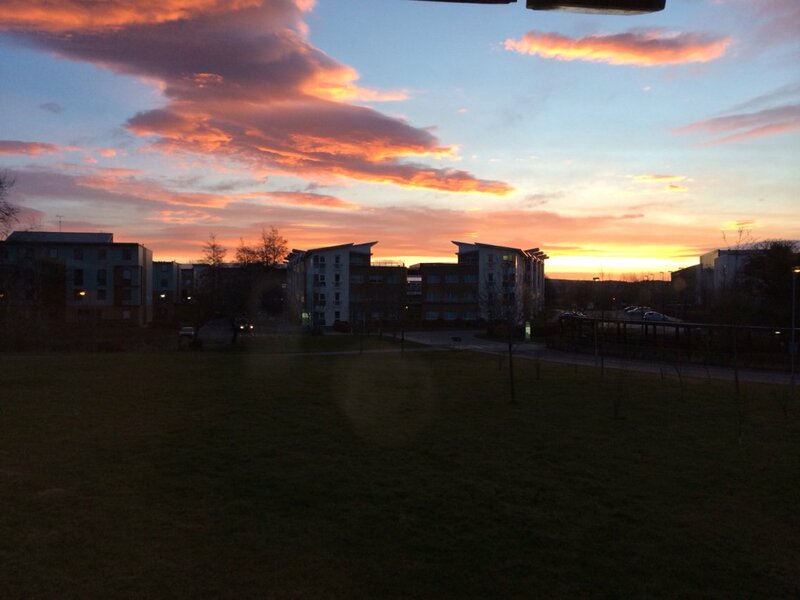 A huge congratulations to Professor Glazebrook and his team for developing an exceptional doctoral training programme in operational research, which engages students with academics and industrial partners and practitioners. I will be back in Lancaster, England in September and am truly honored to be giving a plenary talk then at the OR60 Conference! 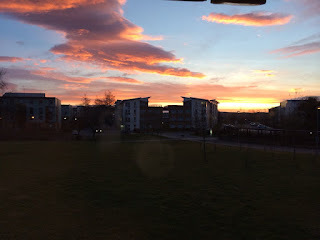 And, one of the best rewards of teaching, is inspiring students and I was so pleased to see that Alan F. Wise wrote an excellent blogpost on the Braess Paradox, after my Masterclass! Coincidentally, I had had a very lovely communication with Professor Dietrich Braess himself, while I was in Europe. And, also, while in Europe, I heard from the renowned physicist, Professor Adilson Motter of Northwestern University, about the publication if his latest paper, which also discusses the Braess (and other related) paradoxes. This paper I thoroughly enjoyed reading after my return. A big thank you also to all the airlines that carried me on 7 flights over 11 days: British Airways, Alitalia, and Aer Lingus. 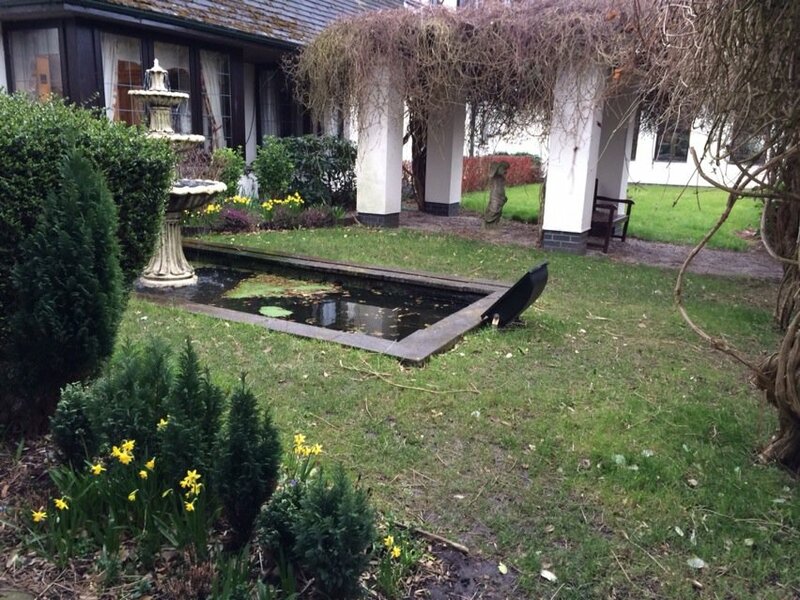 As academics, we sometimes journey to conferences that take place in quite remote locations. And, what never fails to surprise me, is how doing so is so worth it! 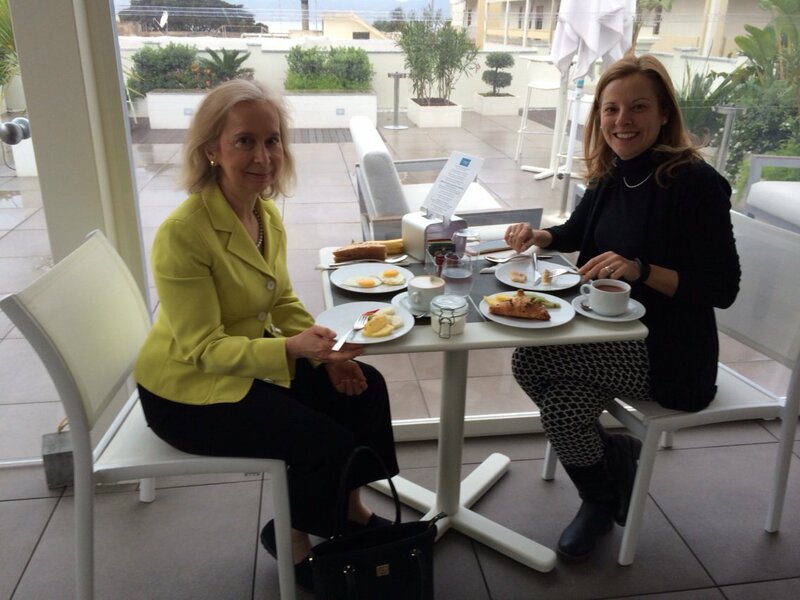 I believe that academics, driven by intellectual curiosity, always want to exchange ideas and to engage in discussions and, if you can do so in locations that are unique, then the inspirations drawn and experiences as well as the memories can be exceptionally rewarding. 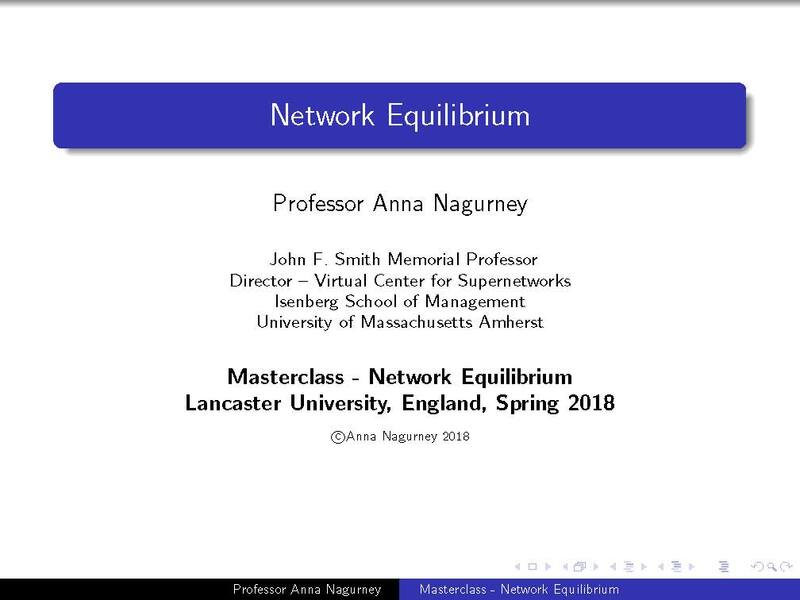 Today, I will be journeying to England, where I will be conducting a master class in Network Equilibrium at Lancaster University next week but, before I head to the airport, I thought it appropriate to prepare and share this blogpost. 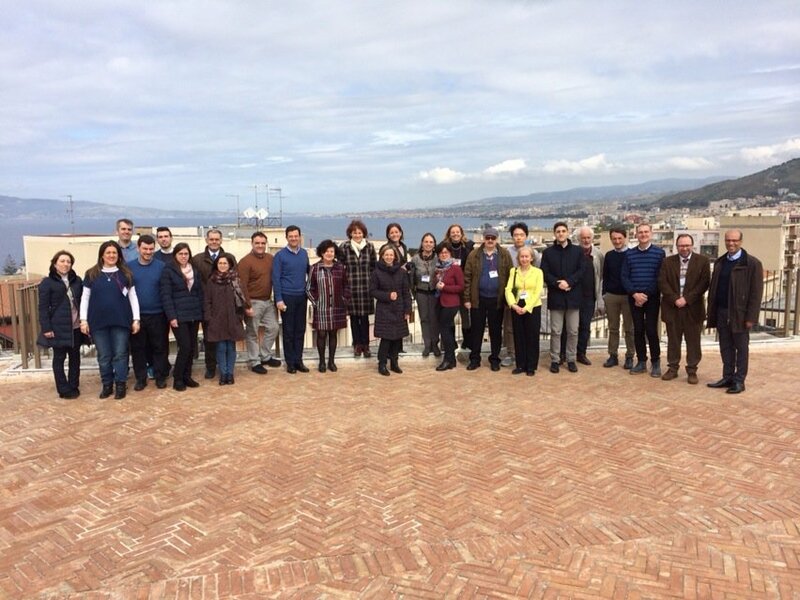 First, I would like to express my sincerest appreciation to the organizers of the fantastic VINEPA (Variational Inequalities, Nash Equilibrium Problems and Applications) 2018 conference, which took place the past two days in Reggio Calabria, Italy. The venue was a castle and the views from the top of the castle are spectacular. 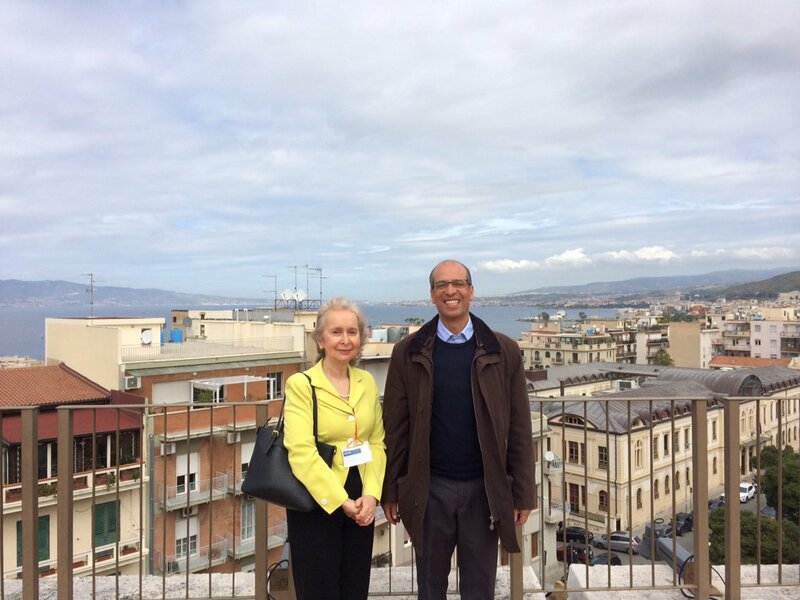 One can see Sicily across part of the Mediterranean Ocean. 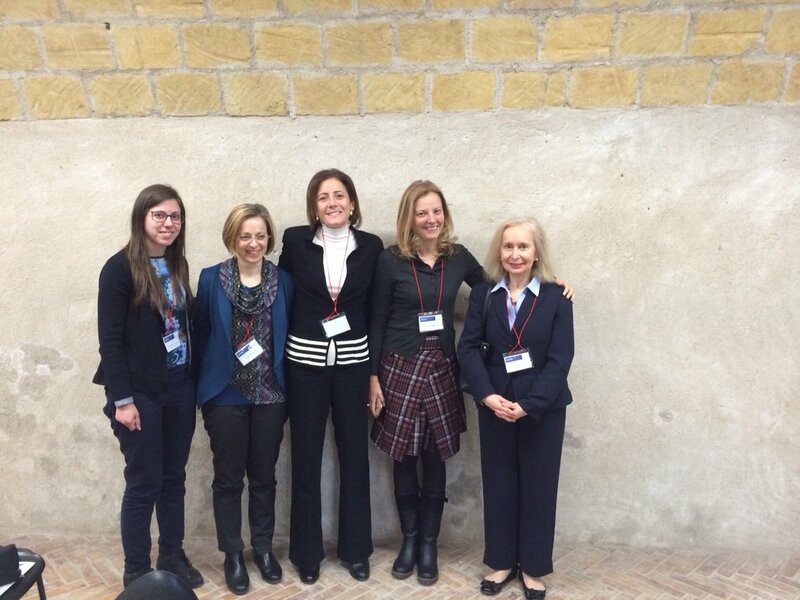 The organizers, who deserve a medal for this exceptional conference, were: Professors Sofia Giuffre', Patrizia Daniele, and Laura Scrimali. How appropriate that they are all females, given that the conference also coincided with International Women's Day! I was invited to give a keynote at this conference and, since the theme of the conference is so perfect for my research, I had to accept. 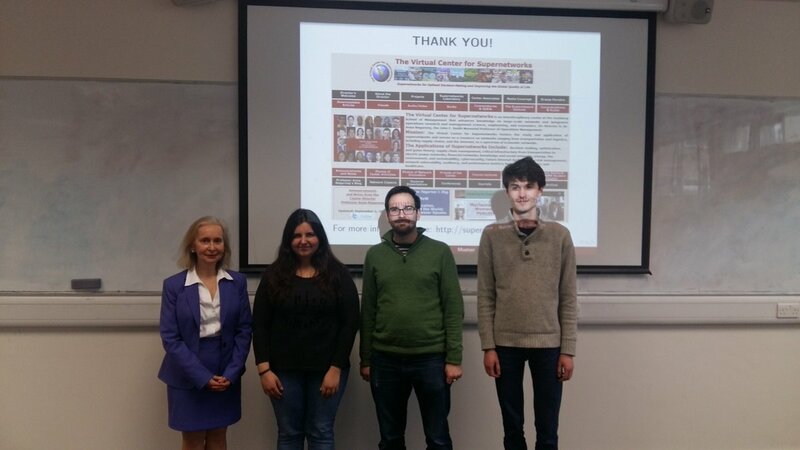 The photo above is of the organizers and of a doctoral student of Professor Patrizia Daniele's, Gabriela Colojanni. We even have a joint paper now on cybersecurity, which is in press. 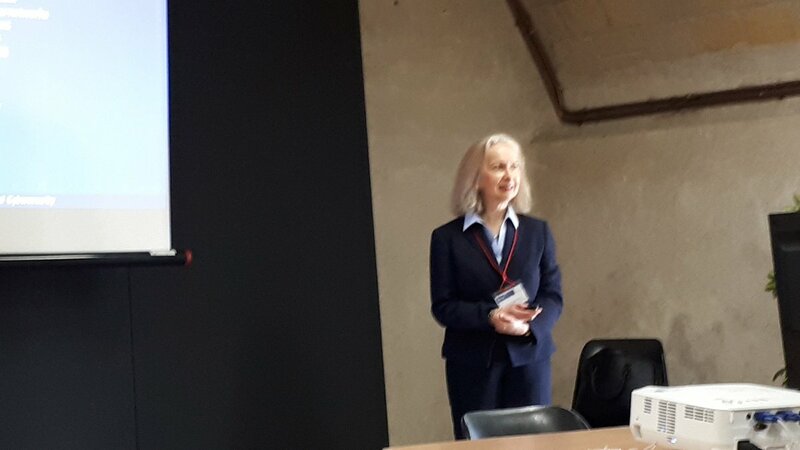 I enjoyed giving my keynote very much and in hearing all the great talks and discussions. The discussions were especially stimulating since the conference convened operations researchers, applied mathematicians, computer scientists, and even those working in areas of economics and engineering. Conferees came from Italy (of course), Denmark, Norway, Russia, Mexico, France, and the USA! Some journeyed for almost 40 hours to get to Reggio Calabria, which is in the "toe" part of the boot that is the shape of Italy. Dr. Igor Konnov, in the photo above, presented me with his book. 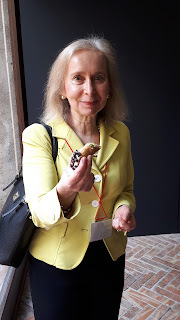 The attention to detail by the organizers was outstanding, with delicious lunches, coffee breaks, a tour of the castle, and a multicourse banquet. Of course, I could not resist having a cannoli! I am carrying back not only great research ideas but gifts from the organizers and several participants! And, we all have new friendships and have renewed friendships! I arrived in Reggio Calabria, Italy yesterday afternoon after twenty hours of travel from Amherst, Massachusetts to Boston Logan and flights via British Airways to Heathrow and then onwards to Rome with the final leg via Alitalia. A big shoutout to both of these airlines for fabulous service and comfort. Reggio Calabria is in (very) southern Italy and is located in the "toe part" of the boot shape that is Italy. One can see Sicily past the Mediterranean ocean and the journey was definitely worth it. I am here, thanks to the invitation of my wonderful colleagues, Professor Sofia Guiffre' of Reggio Calabria and Professor Patrizia Daniele of Catania. They are among my dear co-authors and our paper is now in press in the International Transactions in Operational Research (ITOR). Coincidentally, while I was at the Rome airport, during a 3 hour layover - none other than the Editor of ITOR, Professor Celso Ribeiro, emailed me and told me that he, too, is now also in Europe - on sabbatical in (snowy) Oslo, Norway. Tomorrow I will be giving a keynote talk at the VINEPA 2018 conference, which focuses on some of my methodological loves - variational inequalities and Nash Equilibria! I ambled to the conference venue which is a historic castle. I marched up to the top and took photos of the panorama. On the second floor of the caste there was artwork and the staff was getting our space ready for the conference. I couldn't resist snapping a photo of the one window in the conference room. At the conference, I will see many operations research colleagues from various countries, some of whom I have not seen in quite a while, so I am very excited! Thus far, I have managed to walk for miles (my cure for any jetlag) and walking along the Mediterranean with the astounding landscape, vegetation, architecture, and the kindness of the locals (more on this later) make all the hard work on research (which is actually a joy in itself) worth it. Massachusetts is bracing for another snowstorm so I made it out, just in time! I am a real tree hugger and the last time that I was so awe-struck by the vegetation of a country was when I gave a keynote talk in New Zealand. I have my favorite tree in Auckland. And, speaking of New Zealand, next week I will be at Lancaster University in England, giving a masterclass, and will see Professor Matthias Ehrgott, who is now on the faculty there and who was my host when I was in NZ! The kindness of the Italians in Reggio Calabria is truly special. Not many speak English but that is not a problem, and, last evening, not only did a waiter run up to help me with my trenchcoat but another one treated me to a dessert from the selection below (of course, I chose one the chocolate ones). I love watching the locals promenade along the beautiful mile walkway along the Mediterranean Ocean and also on the main street (which is for pedestrians only) and is filled with elegant shops. I marvel at the elegance of the people and how they acknowledge one another and (this must be the academic in me since we tend to fit anywhere) acknowledge me with a greeting. 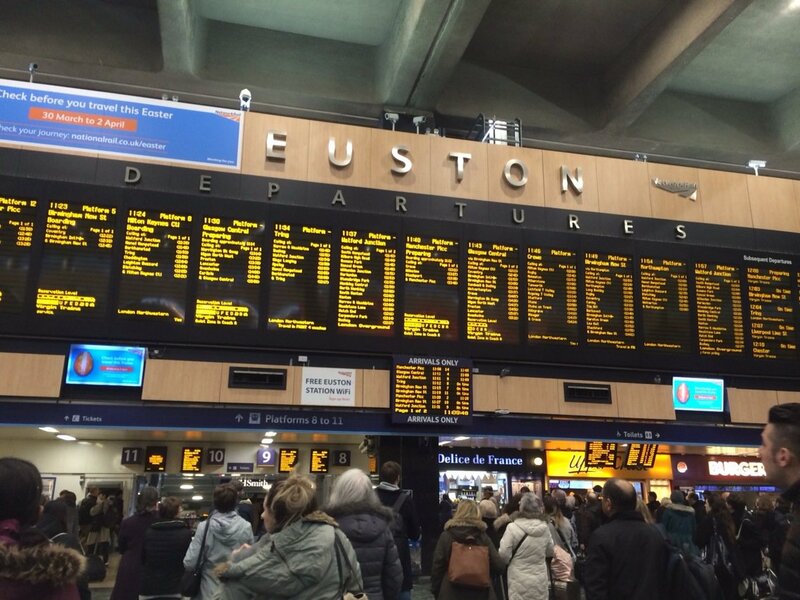 The places that doing Operations Research can take you on our fascinating planet never fail to inspire.